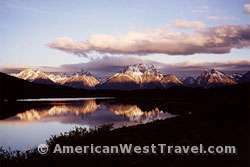 Grand Teton National Park lies in northwest Wyoming immediately to the south of Yellowstone National Park. The park features one of the world’s most spectacular mountain chains, the Teton Range. These precipitous mountains rise directly out of the beautiful valley known as Jackson Hole, reaching an elevation 13,770 feet at the peak of Grand Teton. Being geologically young, little erosion has taken place, leaving extremely jagged and photogenic peaks. Jackson Hole and the Snake River are magnets for all manner of wildlife, from exotic birds to moose. A series of beautiful lakes sit at the base of the mountains. Scenic vistas are everywhere. There are plentiful opportunities for boating, fishing, hiking, float trips, wildlife observation, scenic drives and more. A wide variety of organized outdoor activities are available at the park. These include: youth backpacking, boat rentals, climbing guides, cross country skiing, snowshoe tours, fishing trips, Snake River float trips (scenic, wildlife, and white water), horseback riding, kayaking tours, marinas, Jenny Lake shuttle, sailboating, scenic cruises. Please see our Outdoor Activities in Grand Teton National Park page for more details. While wildlife is plentiful throughout the park, there are specific areas within Grand Teton National Park to observe certain wildlife. Also, the best time to observe wildlife is very early and very late in the day. Whether you are in your vehicle or on foot, you must maintain a distance of at least 100 yards (92 m) from bears and wolves, and 25 yards (23 m) from all other wildlife. Never pursue, block, or chase wildlife by foot or in a vehicle. Avoid loud talking, door slamming, and running. Never feed any park wildlife. Oxbow Bend. A slow-moving, cut-off meander of the Snake River, Oxbow Bend supports lush underwater plant growth and abundant fish, food for aquatic birds. Great blue herons and osprey nest here. White pelicans, double-crested cormorants, common mergansers and bald eagles fish in the shallow water. The marshy area also offers a good chance to see a moose which prefers to be in and around water. We also observed a herd of elk grazing near the Snake River bridge just west of the turnout. Willow Flats. A marshy area a few miles west of Oxbow Bend, near Jackson Lake Lodge. North of the Jackson Lake Dam, moose browse on willow shrubs. At dawn and dusk, elk graze on grasses growing among willows. Predators such as wolves and grizzly bears pursue elk calves in early summer. Beavers create ponds by damming streams that also harbor muskrats and waterfowl. Antelope Flats and Mormon Row. East of Highway 26/89/191, one mile north of Moose Junction. Bison and pronghorn may be seen grazing. Watch for coyotes, Northern harriers and American kestrels hunting mice, Uinta ground squirrels and grasshoppers. Sage grouse, sage thrashers and sparrows also frequent the area. Moose-Wilson Road. Marshy area on east side of road good spot for moose. Gros Ventre River Road to Lower Slide Lake. Lightly wooded area was frequented by deer during our last visit. Snake River. Jackson Lake Dam south to Moose. Elk and bison graze in grassy meadows along the river. Bison also eat grasses on the sagebrush benches above the river. Bald eagles, ospreys and great blue herons build large stick nests within sight of the river. Beavers and moose eat willows lining the waterway. Park Grasslands. Opportunities to observe elk grazing and perhaps pronghorn. The elk generally graze at dawn and dusk, then retreat to the forests during the day. For more information on elk, see Grand Teton National Park’s Elk Ecology and Management brochure (PDF File). Bird Watching. Grand Teton National Park is a great place to view a wide variety of bird species. For more information on where to observe waterfowl and other bird life, see Grand Teton National Park’s Bird Finding Guide (PDF File). Viewing Bear, Coyote, Wolf, Mule Deer, Elk, Bison, Pronghorn, Moose, and other Mammals. For more information on where to observe these and other mammals, please see Grand Teton National Park’s Mammal Finding Guide (PDF file). Grand Teton National Park is extremely popular with hikers and backpackers due to the spectacular and unspoiled nature of the backcountry. Permits are required for all backcountry camping and generally require that you stay in designated backcountry campsites. Please see our Outdoor Activities in Grand Teton National Park page for more details. The park has eight lodging facilities open during the summer and two during the winter. Accommodations vary from rustic cabins to modern motel-style rooms with private bathroom. Reservations can be made by phone or on-line through the park concessionaire. Reservations are strongly advised well in advance of any planned trip. Please see our Lodging in and around Grand Teton National Park page for more details. Six campgrounds operate within Grand Teton National Park during the summer. Most are available on a first-come, first-served basis. Reservations can be made for group camping, the Colter Bay RV Park, and at the Headwaters Campground and RV Sites at Flagg Ranch. Please see our Campgrounds in and around Grand Teton National Park page for more details. For current information on seasons, hours, events, exhibits, and other visitor services, please see the Grand Teton National Park Visitor Centers’ Operating Hours & Seasons or the current issue of the park newspaper, the Grand Teton Guide. Flagg Ranch Information Station. Located 56 miles north of Jackson, 2.5 miles south of Yellowstone entrance station on US-89. Open in summer only. Stop by for trip planning and trail information when leaving Yellowstone National Park. Phone: (307) 543-2327. Colter Bay Visitor Center. Located 37 miles north of Jackson, along Jackson Lake on US-89. Open May to October. Large bookstore, information desk, exhibits, backcountry permits, interpretive programs, and demonstrations. Phone: (307) 739-3594. Moran Entrance Station. Located 30 miles north of Jackson at junction of US-89 and US-26/287. East entrance to park. Pay fees. Brochures and status of campgrounds available. Jenny Lake Ranger Station. Located 20 miles north of Jackson, along Jenny Lake on Teton Park Road. Open May to September. Features in-depth information for visitors planning to climb and backpack in the park. Also, activity schedules, maps, guided walks and talks. Phone: (307) 739-3343. Craig Thomas Discovery & Visitor Center (Moose Visitor Center). Located 12 miles north of Jackson in Moose, on Teton Park Road just off US-89. Open April to beginning of November. The Discovery Center features natural history exhibits, a relief map of the park, and an introductory video. Also, information desk, an extensive bookstore, maps, activity schedules, guided walks and talks, mountaineering exhibit, state-of-the-art exhibits, park documentary, backcountry camping permits, boat permits, restrooms, telephones, and WiFi. A post office is located nearby. Phone: (307) 739-3399. Laurance S. Rockefeller Preserve Center. Located four miles south of Moose on the Moose-Wilson Road. This road is closed to RVs (over 23 feet long) and trailers. Open end of May to mid-September. The Preserve Center offers unique sensory exhibits and trails leading to Phelps Lake, providing extraordinary views of the Teton Range. “Leave No Trace” policy, plan to pack out your trash. The Preserve Center sells bear spray (credit cards only), but does not issue permits. Phone: (307) 739-3654.